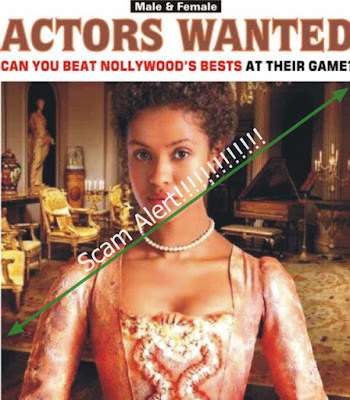 Please note, this viral Nollywood acting audition post is a scam. The individual using nollywood2017audition @gmail.com has duped a lot of prospective Nollywood actors… Don’t fall for it. See the sample posting they are sharing around the social media and blogs. MOVIE AUDITION! MOVIE AUDITION!! MOVIE AUDITION!!! (2) You must be serious and fast in learning. (3) You must pass through an addiction. (4) You must speak good English or have funny in your Actions. (5) You must be God fearing person and be responsible. This are the needed things that you must have before you can join the Nigeria Nollywood industry. HAHAHA.WHO KNOWS IF THEY HAVE ACHIEVED THE 150 APPLICANTS BENCH MARK.THE YAHOO DUDE GO DON HAMMER AND VOLUNTARY FREE KPEKUS OFFERED.ITS HOLIDAY SEASON,ANY THING TO MAKE DOUGH IS OUT THERE.BUT MOST LADIES ACTRESS WANNABES WONT MIND AND PAUSE FOR A SECOND TO CONFIRM IF THE AD IS GENUINE OR NOT.